Arirang Mass Games will be held in North Korean capital Pyongyang from August 1st until September 9th, 2012. Mass Games takes place in the one of the biggest world’s stadium – Pyongyang’s May Day Stadium (for 150,000 visitors). The most magnificent show on Earth involves over 100,000 performers. Amazing choreography, unbelievable synchronism and intricacy of acrobatic numbers – result of many months’ hard trainings of thousands of people. Ninety minute-long spectacular performance really astonishes imagination. After success of the Arirang Festival in 2005, the organizers decided to extend Mass Games into next years. In 2007, August 16, Mass Games entered to Guinness Book of World Records. The record of “largest gymnastic and artistic performance in the world was created in Pyongyang, the capital of the DPRK” the Guinness Certificate says. The Mass Games at Arirang Festival possess an important ideological character praising the Workers Party of North Korea, its armed forces, Kim Il-Sung and Kim Jong-Il. 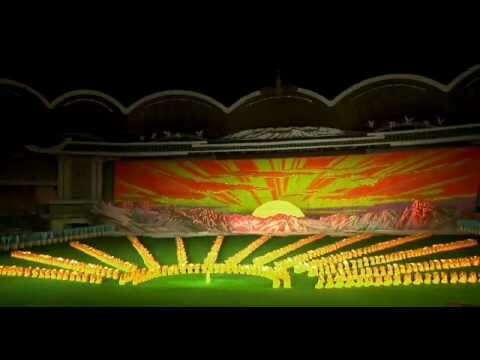 These messages may not be clear to foreign spectators who are not aware of North Korean iconography: a rising sun symbolizes Kim Il-Sung. When a gun is shown, it signifies the gun which Kim Il-Sung gave to his son Kim Jong-Il. The color red, particularly in flowers, stands for the working class. And the color purple and red flowers represent Kim Il-Sung (as the flower “Kimilsungia” is a purple orchid and the flower “Kimjongilia” is a red begonia). A snowy mountain with a lake represents Mount Paektu where Kim Jong-Il is said to have been born in a log cabin. From as young as 5 years old, citizens are selected based on skill level to serve for the Arirang Festival for many years. In most cases this will be the way of life for them until retirement. Don’t miss this unique opportunity to visit DPRK and to see the most spectacular show in the world!